$50.00 Gift Certificate good at Perfectly Polish Pottery. 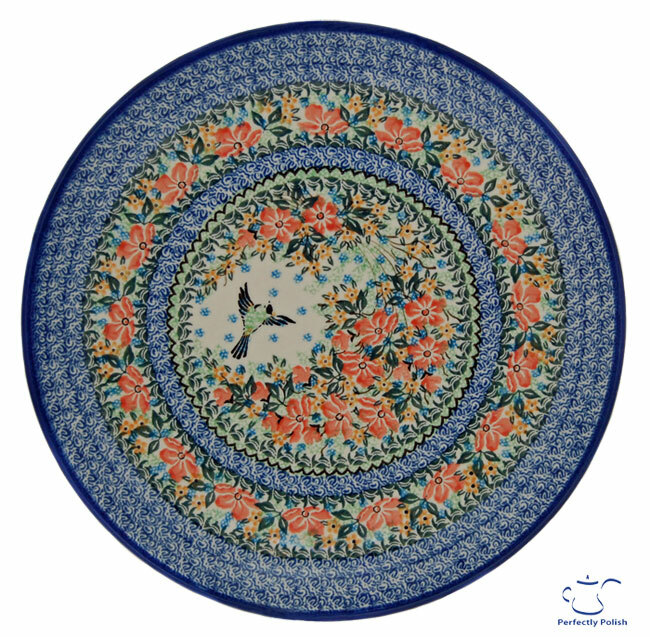 Perfectly Polish specializes in handmade Polish stoneware imported from Boleslawiec, Poland. Gift certificate courtesy of Perfectly Polish Pottery. 2 Polish music cd’s courtesy of Polish Texans Website Mall . 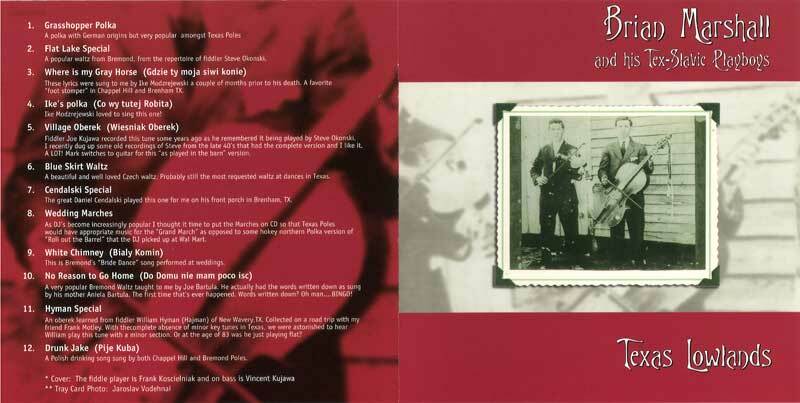 Polish Village Christmas by the Polish American Journal and Texas Lowlands by Brian Marshall and his Tex-Slavic Playboys. 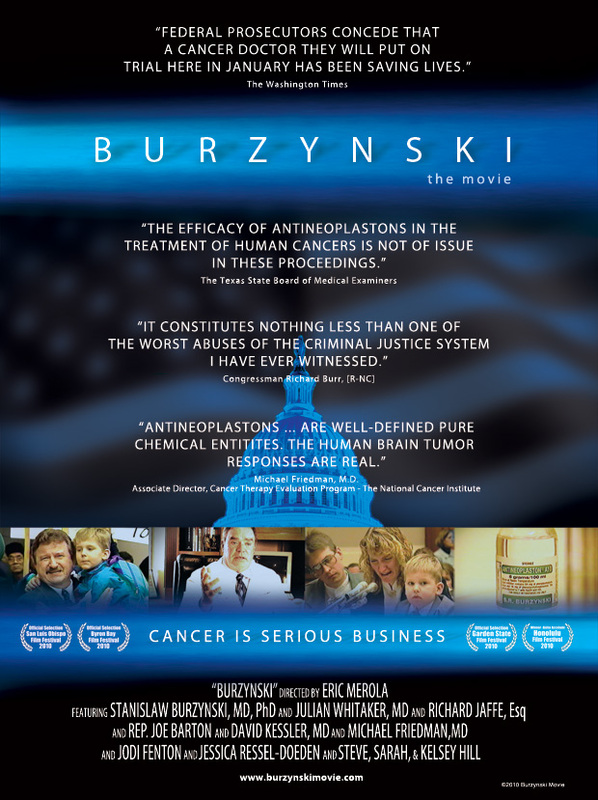 Burzynski is the story of a medical doctor and Ph.D biochemist named Dr. Stanislaw Burzynski who won the largest, and possibly the most convoluted and intriguing legal battle against the Food & Drug Administration in American history. Sweepstakes entries valid from November 16, 2010 until December 15, 2010. The sweepstakes is open to anyone 18 years of age or older. Three (3) prize winners will be selected in a random drawing on December 16, 2010 from among all eligible entries received. Email address must be valid so we can contact you if you win. Email address will not be shown in comment. Who is your favorite Polish hero and why is he/she your hero? Your hero can be anybody you admire as long as they are Polish or of Polish descent. It can be someone from history or a living person, someone who is well known or someone only you know. I struggle between my mother, Augustine Meleski and the greatest Pope of all time, Pope John Paul II. My mother gave me the strength and tenacity to persevere through life’s stormy journeys. Of life’s crosses, she would say, carry your crosses with thanksgiving because of the tremendous faith God has in you to overcome. The greatest gift she left me was the ability to laugh not only at life but at myself. Pope John Paul truly, in my opinion, epitomized what a Christian leader should be. He knew no boundaries, he visited and prayed with people in places where Christianity was not welcome. He was strong and humble in his faith, in his devotion to Catholicism and to the Blessed Mother but he was incredibly tolerate and open to other faith journeys. He was/is a blessed man and a gift to every person who graced his path . Pope John Paul gave me something to strive to become. I am still a work in progress!! God Bless you James for all you do to document our Polish heritage!! Nicolaus Copernicus!! For showing that the sun is the center of the solar system, and being one of history’s greatest geniuses. Thaddeusz Kosciuszko is the Polish patriot and military hero who defeated the Muslim Turks during the 2nd siege of Vienna. It was almost unheard of for a woman to be in the scientific field in the late 1800’s. Born in Krakow in 1867, Marie was the first woman to be honored by winning a Nobel Prize. She ultimately won two Nobel prizes in her lifetime. One honor was in Physics and the other, in Chemistry. The Curies donated the money from the Nobel Prizes to charities and the actual medals bestowed upon them were donated to help the war efforts. Madame Curie contributed to the scientific period table of elements by experimenting with radioactivity, which ultimately led to the determent of her own health. In the early 1900’s, it was amazing that these advanced studies of molecular elements created such significant findings from her research that are still used today. Her team named the first element Polonium in remembrance of her homeland, which at the time, was divided amongst communist rule. This was the first time an element was named after a political controversy and brought attention to Poland’s lack of independence. Polonium made space travel possible. She also aided in the break through of isolating Radium and coined the term radioactive. She helped secure the funding for X-Ray machines in WW I to diagnose many injuries and illnesses. Her daughter also went on in her parent’s legacy to win a Nobel Prize herself in the study of Chemistry. Think of all the indispensable advancements we have benefited from by this discovery, both in modern medicine and in energy production! Madam Curie is lauded as the most influential woman in Science and not only represents the Polish heritage but inspires women from across the globe to achieve the impossible. My Dad, My Hero! He was a gentle, loving man with a wonderful sense of humor and infectious laugh! I lost him many years ago to a heart attack at age 64 and still miss him to this day. I can see him so clearly, to this day, in my “minds eye” with bald head (I never knew him with hair), beautiful water blue eyes, and his up-turned mouth that was always ready to smile especially at his little girl! Coach K at DUKE U. In my opinion all of the early imigrants that left everything, think about that, everything behind to travel over waters they could not even began to image so large, to come to a place they had never seen and chance a new life of , What ? They did this so WE, could now be in a place of continment and safety, that they never had. Some times we take this for granted and don’t stop to think of their suffering to do this. My great-grandmother was one of those making that scarific and she was expecting the birth of my grandmother at the time. These people were my heros. My husband John kochanowski, the most kind-hearted and strong-willed man on this earth. My favorite Polish hero is Lech Walesa. I admire his efforts in establishing the union known as ‘Solidarity.’ In 1983, he was made a worthy recipient of the Nobel Peace Prize. It is very hard to narrow my opinions down to one, single Polish hero! However, I would have to say that Saint Maximillian Kolbe is my favorite Polish hero. He selflessly gave his life at Auschwitz, so that another man could live. There is no greater sacrifice which a person can make. This would be my grandmother Lillian Baranowski Hintzel. She was the one that raise me and taught me the values I have today. She was the perfect grandmother, when I did wrong she made sure I knew it and when I did right she let me know. She took care of me from day one and was there for me whenever I needed her. I learned so much from her and I know she in heaven looking down on me and saying she is proud of how I am doing. She sacifice so much in her life to make sure I grew up right. My grandfather, John Meleski of The White Eagles band is one my polish heros I wish to highlight today. He died when I was 10 years old, leaving me with many wonderful and loving memories. He was my personal hero, not because of any other reason except he took the time to be with me. We walked together many times to the Wilson Bros store on Main and Aurora. Sometimes we strolled, other times we raced and even skipped and hopped on one foot! He would buy me a set of paper dolls from that corner store every time we went! Even when grandma said I didn’t need anymore! He ate Cocoa Puffs with me and danced around singing the trademark song, “cuckoo for Cocoa Puffs”. His laugh was big. and his heart; even more so. He made the best Root Beer floats and we giggled at our mustaches from the foam. He was always crafting something in his garage and he suprised me with a little rocking chair with decals just like grandma’s one year. I’m blessed to have had that little rocker returned to me not so long ago. Besides the love he showered me with, I know how much he loved my other Polish hero, my mom, Augustine Meleski (A hero story for another time.). She worked hard making a loving and caring home for us and our dad, Florian Meleski, Sr. Dad was a busy man, but we were blessed that grandpa was always willing to lend a hand to my mom. They both shared the gift of light-hearted laughter and the art of putting others before themselves. I’m thankful for my two Polish heros. Upon reflecting back on my life, my Polish heros were Szczepan ( Stephan) & Franciszka (Francis) nee Jozwiak Mazurkiewicz. These people were my paternal grandparents and the inspiration that drives my passion and love of our Polish heritage. Szezepan was the youngest of six children and Franciszka was the third child of fourteen and they were both first generation born in the United States. In addition, both of their parents were originally from the Slawno/Weglewo villages near Gniezno in the region of Poznan, Poland. Neither of them finished elementary school or spoke English, but were two of the most influential people in my life. They were honest, hard working, respectful, humble, forgiving, virtuous, thoughtful, obedient and most of all loving. My grandfather (JaJa) was an agriculturist, conservationist, economist, loving husband/father and a musician. JaJa inspired me to major in agriculture, provide for my family, be conservative, frugal and to play the concertina. My grandmother (Babosha) was a teacher, leader, loving wife/ mother, good Catholic and proud of her Polish heritage. Babosha taught me to speak Polish, to be a strong Catholic, how to lead by example, to be proud of my Polish heritage, the importance of family and friends and to encourage others to embrace their culture and customs. Because of the love and support of my grandparents, I have been personally blessed with many rich and beautiful treasures. There is no doubt that these two individuals have been most instrumental in my life and there is no question that their impact lives on today, especially in my personal and professional life. It is both an honor and privilege to have a family that is so united and proud to share the rich polish culture with family members as well as welcoming all who are intrigued with a heritage that leads by example the essential elements of the true treasures of life. The true treasures of life that epitomize genuine happiness and fulfillment are faith, family values, and cultural traditions. Our polish heritage has been embraced with welcoming arms and has brought elevated happiness to all that have participated and have become involved with the many well orchestrated events and a very special and meaningful polish wedding and reception for Phillip and myself. The vigorous leader that has opened the door in sharing the polish history, customs, faith, and the importance of family is my father, Jim Mazurkiewicz. He has opened our hearts and eyes to a very meaningful and special way of life that will be passed down from this generation to the next. Dad, thank you for everything that you have done for this family and our friends. I have many Polish heroes. They are the men and women who serve in the armed forces everyday so that we can be free to celebrate our heritage and culture. Our early immigrant ancestors left Poland and came to America to be free from war and hardship. When America was called into war, they gladly joined the armed forces to keep their adopted country free. Many died, and yet today, their children, grandchildren and great grandchildren courageously choose to keep this country free so we can continue to celebrate our heritage. These men and women are our true heroes. My favorite band in polish music is Daniel Cendalski , Daniel and the Country Boys. Also Pete Kwiatkowski was a legend of polish music, Daniel has played for 63 years this December. My mom is my hero. Sadly, Mom passed away in 2006 from ALS, and I miss her every day. My mom, Mary Kyrish Pieniazek, endured 2 years of suffering from ALS. Mom’s first symptom was slurred speech. We all suspected a stroke and were shocked to learn she had ALS. Despite losing her ability to speak, eat and later, move as she once had, Mom was a model of self sufficientcy and dignity. Mom grew up in a very poor Depresion era farm family. She picked cotton for to help support her family as soon as she could walk. She dropped out of school in the 9th grade to care for her mother who was dying of cancer. She raised four children, and made certain they all received college degrees so that they would not share her type of hard life. Wasn’t this enough hardship for one lifetime? Sadly, it was not. Mom lost her ability to speak, eat and live on her own in her final years. She was brave, determined and inspirational in her final years as she bravely tried to fight the effects of ALS. My mother is the bravest and most incredible person I have ever met. I love her dearly and willmiss her forever. There are so many heroes throughout Polish history. My favorite Polish hero is Irene Gut Opdyke. She was a Holocaust rescuer. She is my hero because of the hardships she endured throughout World World II, and the immense risks she took to save the lives of several people in hiding. I recently read her autobiography entitled “In My Hands.” This is the first book I ever read front to back in one sitting! She was an amazing woman with amazing courage. Bruno Schultz because he was a real Renaissance man in terms of interest.